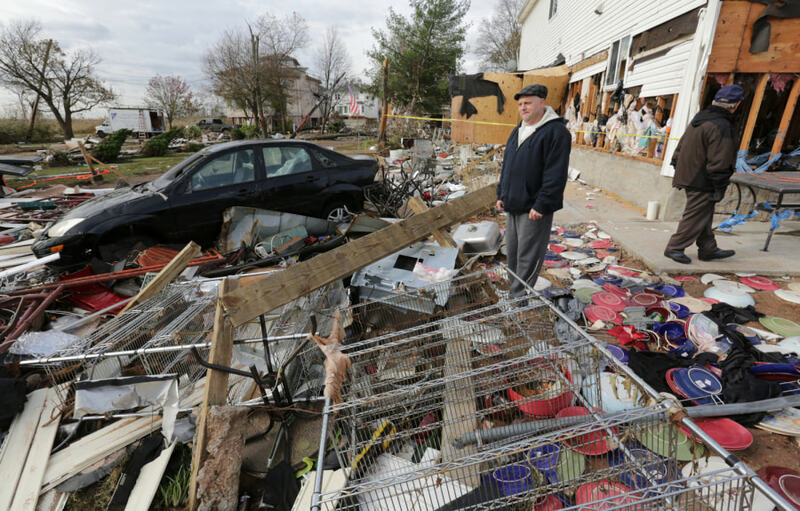 John Dellorusso looks over his backyard which now contains the debris from a nearby restaurant. His home at right, was severely damaged, and his girlfriend refuses to return to the house. 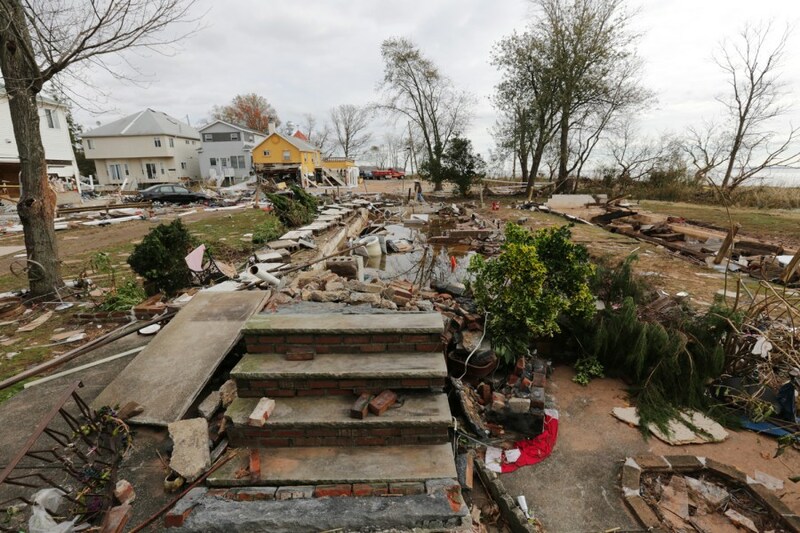 The foundation and stairs are all that's left of George Dresch's house on Staten Island before it was wiped away by storm surge from Hurricane Sandy. 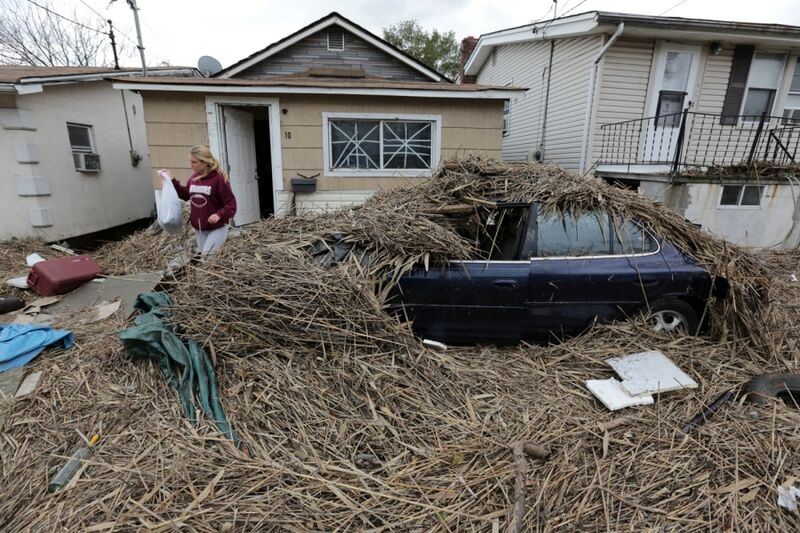 In John Dellorusso's yard a Halloween decoration sits amid the rubble from Hurricane Sandy. 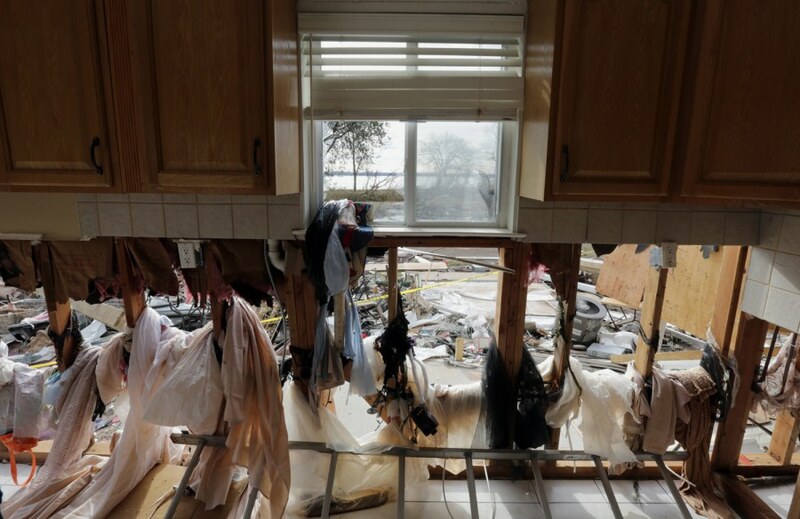 Storm damage done to John Dellorusso's kitchen in Staten Island following Hurricane Sandy. A statue stands where George Dresch's house once stood. John Dellorusso lives in Staten Island on Yetman Avenue, next door to the Dresch family. 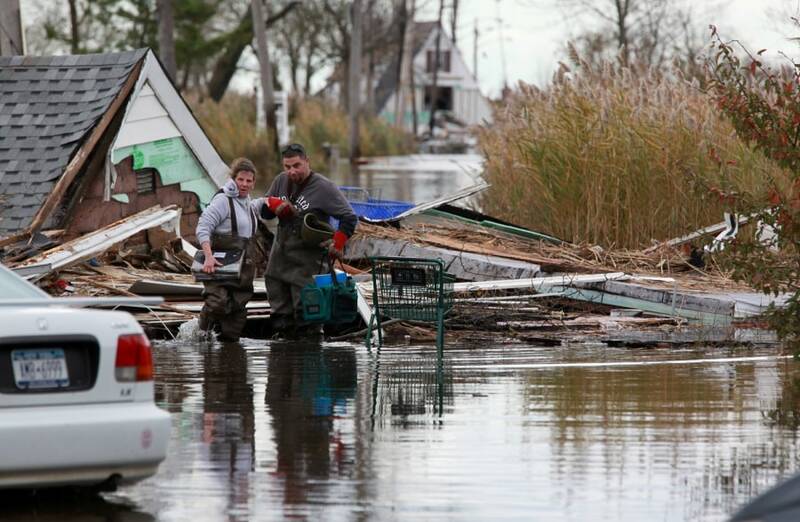 George Dresch and his daughter Angela, 13, died when their home was flattened from Hurricane Sandy's storm surge, which sent over eight feet of water into the neighborhood. George's wife, Patricia, is reported to be in critical condition. 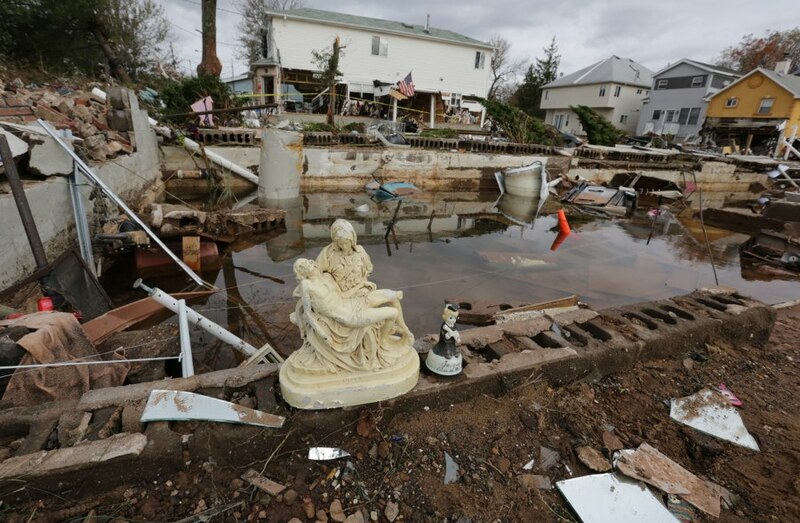 George had been reluctant to leave his home because when they evacuated for Hurricane Irene, their home was looted while they were gone, according to Dellorusso. George Dresch’s cousin, Tom Monigan, spoke about the devastation on the island: "To be down here and see this, I've seen a lot of storms…the streets used to get flooded, but this? Not in a million years, did I expect to see this. You can replace the stuff, but it's what happens to people, it changes their life forever and it's terrible. People are worried because they don’t have electricity? Jesus, this is the real deal right here." The death toll in Staten Island reached 19 today, after the bodies of two children who had been missing were found. The boys, ages 2 and 4, were swept away from their mother’s arms Monday night after the car they were driving was swamped by flood waters. Jane Caravello and her son Vincent look for personal items after the storm blew the roof off her home in Staten Island. 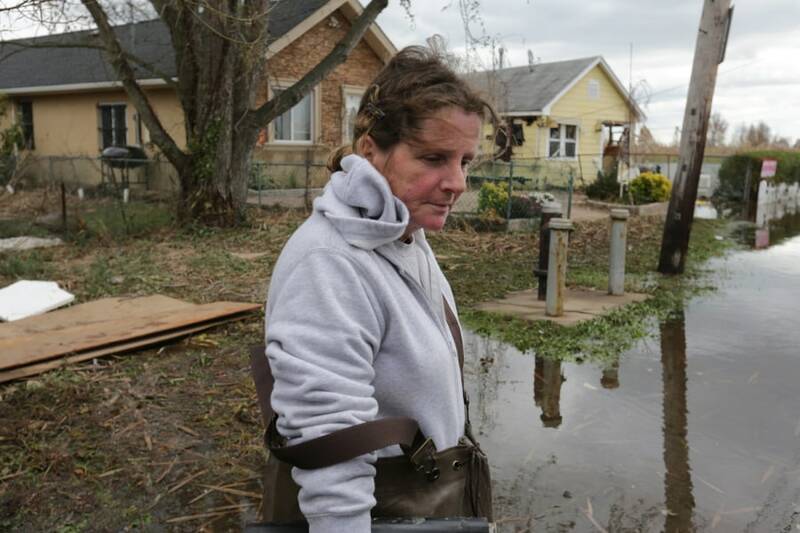 Jane Caravello pauses for a moment after wading into the flood water near her home. Jane Caravello and her son Vincent waded into the waters near her house on Staten Island looking for personal items blown away after the roof was taken off during the storm. "Half of it’s down there and the other half is on Beach Ave," said Caravello. 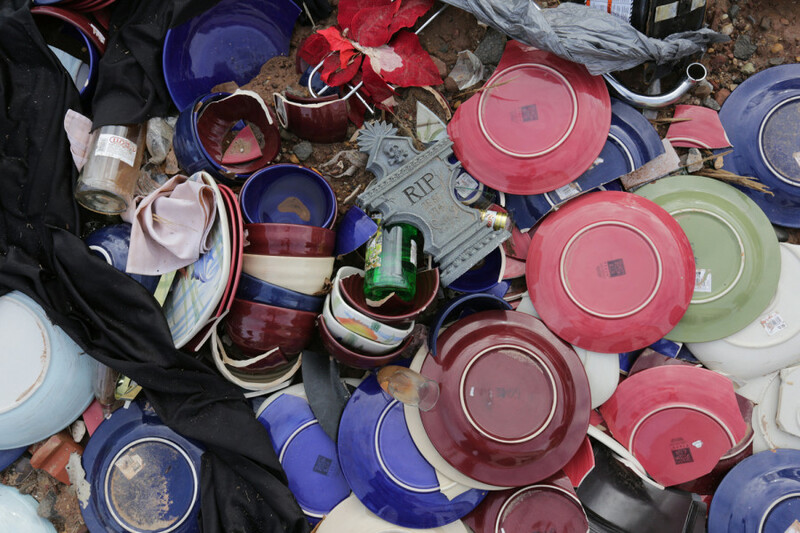 Many of her belongings were found spread over a couple of blocks, but she was unable to locate her photo album. Veronica Janul carries salvaged clothing from her friend's house, Thursday on Kissam Avenue on Staten Island.